Stock photo of a beautifully decorated Christmas tree inside the Bankers Hall shopping atrium in the city of Calgary, Alberta, Canada. Exquisitely decorated Christmas tree in the atrium of the Bankers Hall, City of Calgary, Alberta. 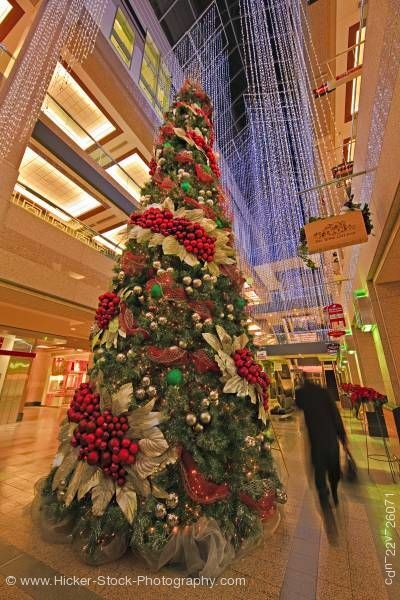 This stock photo shows a beautifully decorated Christmas tree inside the Bankers Hall shopping atrium in the city of Calgary, Alberta, Canada. The Christmas tree is exquisitely decorated with smooth and satin balls of different shades of red that are surrounded with gold leaves giving the look of holly berries. The tree has gold balls and red netted ribbon trimmed along with green balls added throughout. A beautiful gold netting encircles the bottom. Along the mall's tiled walkway are red poinsettia plants. Hanging from the high vaulted ceiling of the three story mall are strings of clear beads giving the a wintry effect of icicles. To the right of the tree is a man with his briefcase walking briskly by. Decorated Christmas tree inside the Bankers Hall shopping atrium in the city of Calgary, Alberta, Canada.